The Men's and Women's 18 Beach EURO takes place in Ulcinj, Montenegro from 29 June to 1 July, and it will be the biggest ever played to date. 34 teams have registered for the three-day championship, 17 in the men's and 17 in the women's event. Overall, these 34 teams stem from 19 different nations. Never before have so many teams participated at a younger age category Beach EURO. The teams have been seeded in the following groups. The first two teams of each group qualify for the quarter-finals. The full playing schedule is available for download. 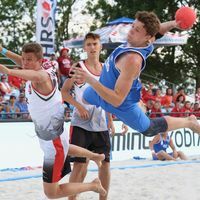 Last year at the Men's and Women's 17 Beach EURO in Zagreb, Spain topped the men's podium ahead of Hungary and Germany, while the Netherlands won the women's event ahead of Portugal and Germany.